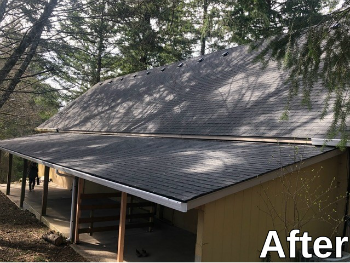 If it’s time to replace your old composition shingle roof, you might be considering whether to have new shingles installed right over your existing roof, which we call a “re-roof,” or tear off the original shingles and start fresh. A re-roof is one way to reduce your short term costs, but it’s not always the best investment. Sometimes a re-roof may not be a viable option. For example, if your roof already has multiple layers, curled shingles creating an uneven surface, or if any rot or mold exists, a re-roof could be a mistake and the result would only be, at best, a temporary boost in curb appeal. At Warner Roofing & Construction, we always perform a detailed inspection to get a good idea of your roof’s quality and the extent of decay. If your existing roof is free of issues then a re-cover may save you money in the short term. But, there are still some downsides to consider. When the time comes to completely replace your roof it will cost more to remove additional layers. There is no opportunity to have your roofing deck checked for possible damage that cannot be seen from inside the house. Multiple layers of shingles make leaks more difficult to track. When layers of shingles deteriorate underneath new ones, it can affect the appearance of the new roof. Heat that builds up within the layer(s) of shingles underneath can shorten the life of the new shingles. The understructure of your roof will be thoroughly inspected and damaged or dry rot sections will be replaced. In high-risk areas like skylights and chimneys, ice, water and new flashing assemblies will be installed. No matter what, you can count on Warner Roofing & Construction for exceptional results. Find out about our 10-year workmanship warranty on a new roof! 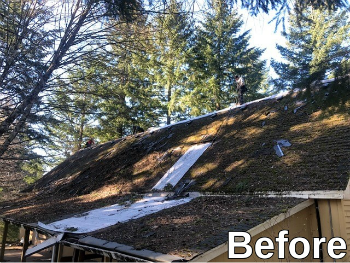 Ready for a new roof? Contact us now to discuss your options, or schedule a free estimate.